This is the Picture of Duke Kahanamoku Atop a Surfboard, For Advertising Washington’s Day. ENGRAVED AND PRINTED BY HAWAIIAN GAZETTE CO., LTD., HONOLULU. 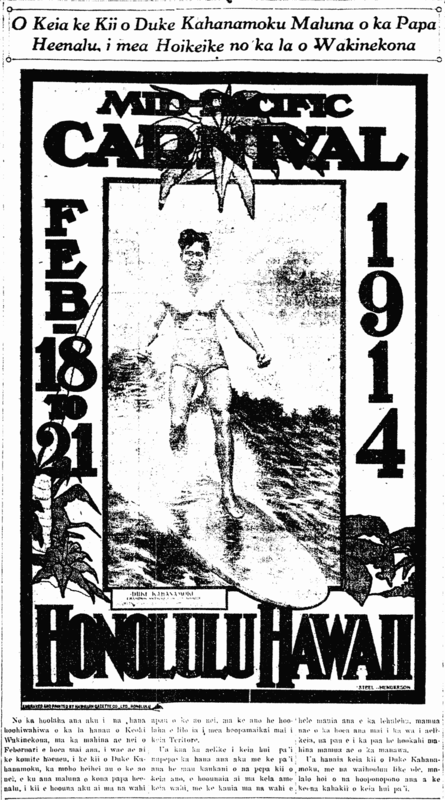 To advertise the celebration of the birth of Washington, in the coming month of February, the Promotion Committee has chosen the picture of Duke Kahanamoku, the swimming champion of the world, standing atop of his surfboard, as a picture to send all over the world as advertisement to benefit this Territory. This newspaper company received the contract to create and print some thousands of these illustrations, to be sent all over, and posted at places where crowds assemble; it was finished a month before the date of completion as set in the contract. This image of Duke Kahanamoku is done in multiple colors, under the direction of the art department of this publishing company. Nupepa Kuokoa, Buke LI, Helu 39, Aoao 5. Okatoba 3, 1913. 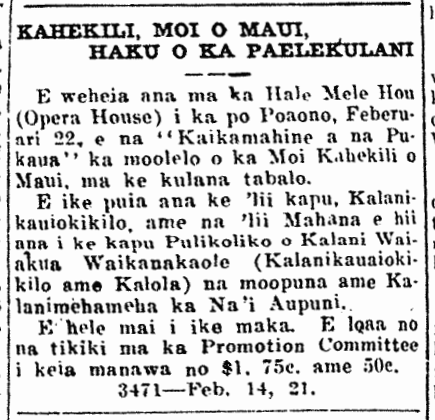 Announcement for a Play about Kahekili, 1913. Also appearing will be the kapu chief, Kalanikauiokikilo and the alii Mahana who carry the kapu Pulikoliko of Kalani Waiakua Waikanakaole (Kalanikauaiokikilo and Kalola) the grandchildren and Kalanimehameha, Ka Na’i Aupuni. Come and see for yourself. The tickets are now available from the Promotion Committee for $1., .75c., and 50c. Nupepa Kuokoa, Buke XLIX, Helu 7, Aoao 8. Feberuari 14, 1913.